But what is EMDR and how is it different from straight talk-therapy? 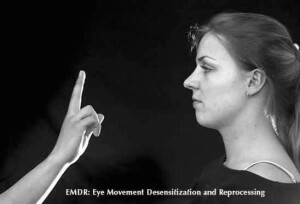 EMDR is a therapeutic technique specially trained therapists use to make shifts in present day responses and states of being like anxiety, panic, distress, depression, and fear. Rapid eye movement or alternate bilateral (tactile or auditory) stimuli are used to access the brain’s system of information processing. This then allows the brain to process old disturbing experiences in a new way resulting in improved emotional responses. Improved responses to emotional distressing experience can create a sense of relief, freedom, and joy in everyday living. EDMR can improve a client’s daily life by desensitizing him or her to present day emotional states that are disturbing, yet related to past distressing experiences. By reprocessing old memories, clients can learn to see distressing experiences from a new perspective, improving the way related emotions are experienced and expressed in the present day. During distressing events the brain shuts off its emotional center, which traps parts of the memory without being fully processed by the “thinking brain” like normal events. EMDR helps clients move this trapped memory into the language based area of the brain, resulting in a sense of relief about the original issue or incident that is being processed. This month as a part of our Holistic Professionals Group, Cathy Canfield, LICSW will present on using EMDR in one’s practice. Cathy is trained in providing EMDR and will be discussing how she uses it and what kinds of clients can benefit most from these sessions. This will be an interactive discussion with an experiential component and plenty of time for open discussion. Learn how your clients can benefit from receiving EMDR as an adjunct to your work and how knowing about this unique technique can influence your approach to your clients with disturbing emotional responses to past events. As a member of the Holistic Professionals Group this session is absolutely free as a part of your membership. Not yet a member? No worries! Simply click here to register for this session at the drop in rate of just $25 or join the Holistic Professionals Group today for $120 for an entire year.